The EU1000i may be fully enclosed to keep down noise, but it’s still simple enough that owners can do most of the maintenance themselves. Here’s how you can keep Honda’s tiny EU1000i generator ready to power your tailgate parties and camping trips. Before each use – Check the oil and air filter. After the first month or 10 hours of use – Change the oil. Every three months or 50 hours – Clean the air filter. Every 6 months or 100 hours – Change the oil, check the spark plug and clean the spark arrester. Every two years or 300 hours – Replace the spark plug. Every two years – Check the fuel line for cracking. Every 300 hours Clean the combustion chamber. Fuel should be used within one month of purchase. If the fuel is treated with a stabilizer, it can be used up to three months after purchase. When adding fuel, do not fill past the red mark inside the filler neck. The top of the cap has a lever that opens and closes a vent. This vent should be open while the engine is running and while the engine is cooling down after use. Once the generator is cool, the vent should be shut to prevent fuel from leaking during transport and storage. To access the air filter, dipstick and drain plug, remove the maintenance cover on the left side of the generator. Turn the cover screw counter-clockwise and lift the cover up. To access the spark plug, remove the access cover on top of the generator next to the handle. To access the muffler, remove the cover on the rear of the generator. It’s held in by four 5 mm screws. 10W30 and 5W30 oil are recommended for all operating conditions. SAE 30 can be used at temperatures above 50°F. This engine has Oil Alert, which will shut off the engine if the oil level is too low. If this feature is triggered, it will turn on a light on the control panel. To check the oil level, remove the dipstick from the filler neck, located on the bottom left of the engine. Wipe off any oil and reinsert the dipstick, but don’t screw it back into the filler neck. To change the oil, turn off the engine switch and close the fuel filler cap vent. Remove the dipstick and unscrew the drain plug at the base of the engine. Tilt the generator, letting the used oil flow down through the channel on the case into a container. Reinstall the drain plug. Add oil through the filler neck. With the generator sitting on a level surface, the oil should come up to the edge of the neck. This engine holds about 8 ounces of oil. The air box is located to the right of the engine. To access the filter, push down on the tab at the top of the air box cover and lift the cover straight up. Clean the filter in warm, soapy water. Squeeze out the filter and let it air dry. Dip the filter in clean engine oil and squeeze it out. To make this process cleaner, consider putting the filter and oil in a plastic bag. Do not twist the filter when washing or oiling. The spark plug is accessed through a maintenance cover on top of the generator. The plug gap should be between 0.024-0.028 inches (0.6-0.7 mm.) Replace the plug if the washer or insulator are damaged, or the electrode is worn down. When installing the plug, thread it in by hand until it seats. Use a spark plug wrench to turn it another ¼ turn if you’re reinstalling a used plug, or ½ turn to crush the washer on a new plug. The arrester is inside the tailpipe, sandwiched between the muffler and the engine’s exhaust port. Once the back cover is off, remove the three 6 mm bolts holding the muffler onto the back of the engine. Remove the muffler. It should come off with the spark arrester and gasket. Pull the spark arrester out of the muffler and scrub off any carbon deposits with a wire brush. If the arrester or gasket are damaged, they should be replaced. Reinstall in reverse order. Need Something For Your Honda Generator? Hondalawnparts.com is an authorized Honda Engines and Honda Power Equipment dealer. That means we can ship OEM parts and accessories to your door whether you live in the U.S. or Canada. We have sections for common parts and generator accessories, or you can use our search engine to find the right part for your specific equipment model. Our site even has factory diagrams and descriptions, so you know exactly what you’re ordering. Are you looking for portable power without having to sacrifice quality? 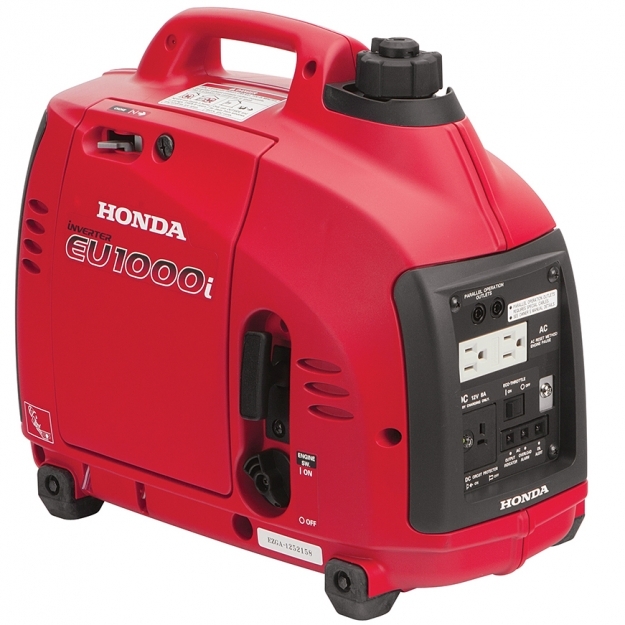 Honda’s EU1000i generator is perfect for camping and tailgating, offering enough power for common appliances, while its lightweight design makes it easy to move. A full enclosure keeps down noise, while advanced features like Eco Throttle and Oil Alert save money on fuel and repairs, making it the perfect choice for electric power on the go. This generator can output a steady 900 watts (7.5 amps) and peaks at 1,000 watts (8.3 amps) to handle momentary load spikes. Like Honda’s other generators, the EU1000i has a built-in inverter to create a clean power waveform. That means the alternating current coming out of the outlets is smooth and steady like it is from grid power, so it won’t burn out sensitive electronics. The 0.6-gallon gas tank can power this generator for up to three hours and twelve minutes at 100% load, and about 7 hours and 6 minutes at ¼ load. Honda’s Eco Throttle automatically adjusts engine speed to match the current electrical load, so you’ll always get the best fuel consumption. The generator is driven by a four-stroke, 50cc GXH engine. The GHX is a popular choice for water pumps, compact farming equipment, and go-kart racing. The engine, generator, and circuitry are housed in an enclosed case to keep things quiet. When running, it makes 42-50 dB of noise, which is about as loud as the ambient noise in an office building. In most situations, unless you’re standing next to it, you won’t really notice the sound from the engine. The engine on switch and starter handles are built into the side of the case, and there’s a built-in oil channel and spark plug access for easy maintenance. Oil Alert comes standard, shutting off the engine if the oil level is too low to keep the engine lubricated. The generator measures 20 x 13 ¼ inches and weighs just 29 lbs, making it easy to carry using the built-in handle. Appliances connect to the generator through a 125-volt duplex outlet rated at 15 amps. That’s two standard outlets sharing the same circuit breaker. There’s also a 12 volt, 96-watt connector rated at 8 amps for recharging automotive batteries. Using this connector requires an optional 12-volt cable. The front panel has indicator lights for overload and Oil Alert, and there’s a large ground terminal connector for using an external ground. Granted, you’re unlikely to be using this low power generator in ways that would require an external ground, such as using appliances on metal floors or wet areas. What Can This Generator Power? Electric motors are reactive loads, requiring large amounts of power to start before settling down and drawing small amounts of current. For this reason, power draw from refrigerators, air conditioners, pumps and all but the smallest power tools are too much for this generator, even if the rated watts or amps are well within its operating range. Need more power? The EU1000i has a parallel connector, letting you link two of these generators together with an optional parallel cable, doubling output without sacrificing portability. Honda guarantees the EU1000i and the GXH50 that powers it for two years of residential use or one year of commercial use. Hondalawnparts.com is more than just lawn care: we carry OEM parts and accessories for everything from Honda Power Equipment and Honda Engines including their generators. Check our Generator Accessories section for parallel cables and 12-volt cables, or use the search engine to find replacement parts for your specific model. Our site can break down parts listings down to specific serial number ranges, and it can show you factory parts diagrams and descriptions so you can be sure you’re ordering the right part. We ship across the U.S. and Canada.